Little Hanoi Hostel i Hanoi, Vietnam: Reservér nu! WELCOME TO LITTLE HANOI HOSTELl! 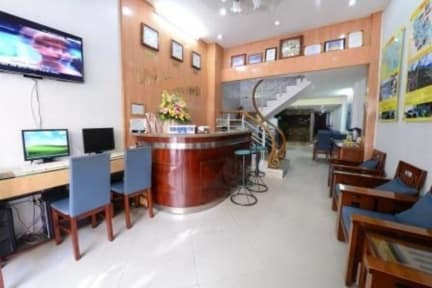 We are located in the old quarter of Hanoi and is situated close to all of the popular attractions like the water puppet show, tourist streets and Hoan Kiem Lake. All rooms have modern facilities. Those of us who work here are like one big family - as such, this is the way we treat our guests. All the rooms are clean, comfortable and spacious. They have hot water 24 hours, cable TV, A/C, and modern bathrooms with bathtubs. Those are just the necessities - as a special extra, you will have fresh fruit and flowers brought to your room daily. Breakfast is included at our Price List from July 21st, 2018. Our restaurant is located in the lobby where you have access to FREE internet and WI-FI. Getting information about all kinds of tours that meet many styles and budgets for every traveler is easy!!! Just ask our helpful staff at reception. Our main focus is on Halong Bay and Sapa Tours. We are more than happy to arrange some great day trips and excursions around Hanoi and to the surrounding villages for you. Our number one priority is giving all of our guests an excellent holiday in Hanoi. *Free breakfast from July 21st, 2018.